Recently, I had the chance to see Pilgrimage, the Annie Leibovitz exhibit currently at the Smithsonian American Art Museum. There’s plenty here to delight word nerds: photographs of Emily Dickinson’s dress, Virginia Woolf’s writing desk, Thoreau’s bed, Emerson’s hat . . . the list goes on. 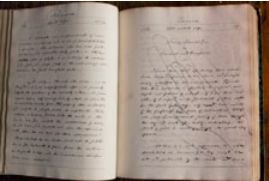 My particular favorite was a photo of the journal of Bronson Alcott. It’s one of several photographs taken at Orchard House in Concord, Mass. Take a close look—you’ll see the outline of Bronson’s hand enclosing the much smaller outline of the hand of his daughter Louisa May Alcott. Visit here for more images from this exhibit. If you can’t make it to Washington, D.C., the exhibit will begin its national tour in June at the Concord Museum. Watch a video about Pilgrimage.